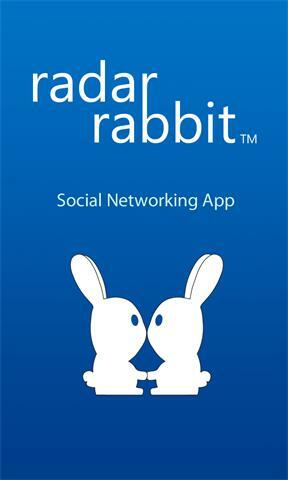 Radar Rabbit is a new social network for the Windows Phone. Meet people and make new friends from around the world. Browse profiles of other members, chat in private or in World Chat, a forum where all messages are public. Earn carrots to climb the leader board and buy virtual gifts for other members. * Upload your profile and unlimited photos * Describe your perfect match * Send unlimited free voice/text/picture messages to other members * Earn virtual carrots to climb the leader board and buy virtual gifts for other members * Uses the phone's GPS to find other members in your area * Rates member compatibility on a scale of 1 to 3 carrots * Ad-supported - full access with no membership fees * Virtual carrots, the currency used in Radar Rabbit, can be earned or purchased using in-app purchases. * Ad-free time can be purchased using in-app purchases. 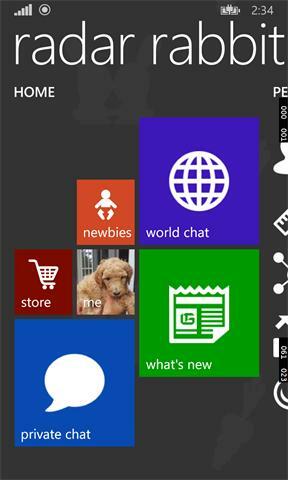 * Customize the layout and colors! Radar Rabbit takes your privacy and safety very seriously. Only approximate member locations are shown or recorded. All communication between members on Radar Rabbit happens through an anonymous chat service. Reveal to other members only the information you choose. So what are you waiting for? Get hopping and sign up with Radar Rabbit! You must be 17 years old or older to install and use this app.